FREE APPRAISAL. To buy, auction, sell or consign your Harvey Cushing autograph that is for sale, please email Nate@NateDSanders.com or call the Nate D. Sanders Auction House (http://www.NateDSanders.com) office at (310) 440-2982. Dr. Harvey Cushing dedicated his life to brain surgery and is remembered as one of the most influential neurosurgeons. He extensively studied brain tumors and was the first to describe Cushing’s disease, one of the causes of Cushing’s sydrome. In most cases Cushing’s disease is caused by a tumor of the pituitary gland, ultimately leading to increased cortisol in the body that causes a host of issues such as high blood pressure, high blood sugar and brittle bones. Impressive set of two books signed by Dr. Harvey Cushing, the “Father of Modern Neurosurgery.” Cushing signs “The Life of Sir William Osler,” his Pulitzer Prize biography about his mentor, and inscribes it to Dr. Fred Ellsworth Clow, who pioneered the first studies on anorexia in the 1930’s. Signed on the front free endpaper, “Inscribed for Dr. Fred Ellsworth Clow with the regards of Harvey Cushing / New Haven Oct. 25 1938”. 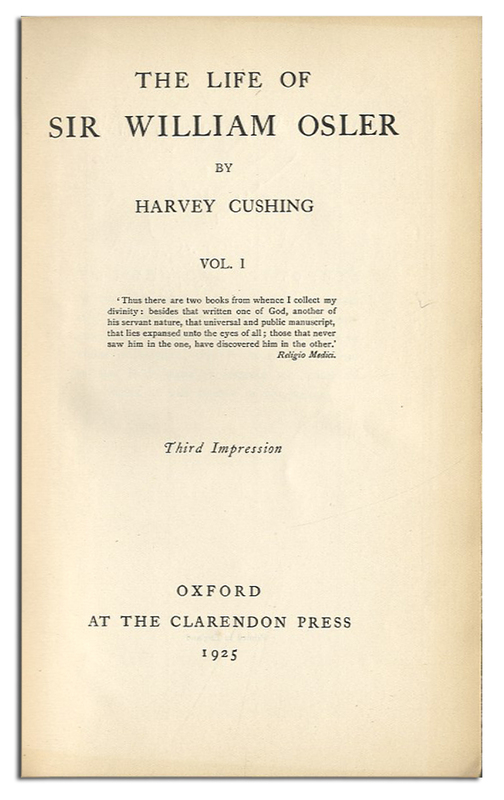 Oxford University Press: Oxford: 1925, third impression. Clow’s bookplates to pastedowns. Overall very good. Sold for $1,074. 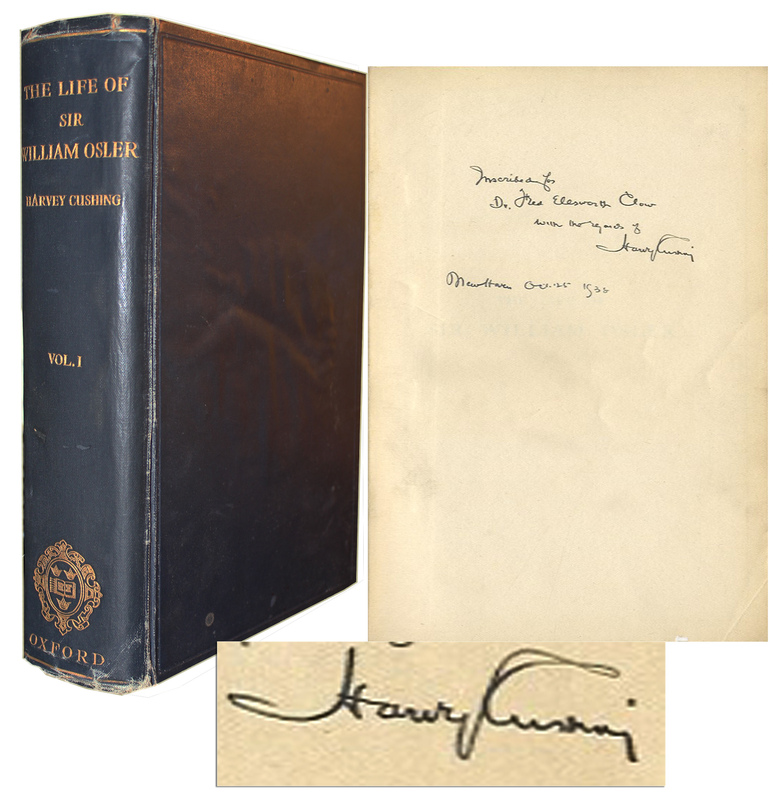 Dr. Harvey Cushing Signed Biography of Dr. William Osler. Click to enlarge. FREE APPRAISAL. To buy, auction, sell or consign your Harvey Cushing autograph that is for sale, please email Nate@NateDSanders.com or call the Nate D. Sanders Auction House (http://www.NateDSanders.com) office at (310) 440-2982. 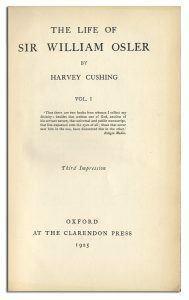 Please let us know if you have a Harvey Cushing autograph for sale.